Camera comes with batteries, a/c power and (2) 128GB XQD Media cards. The new camcorder is designed for a range of long-form shooting and production applications, from documentaries and reality TV to magazine shows, commercial and corporate applications. 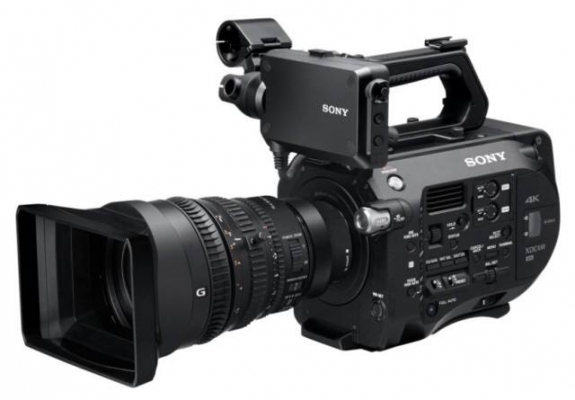 The PXW-FS7 is a native E-mount camcorder designed to give users maximum lens options and flexibility, smooth and silent iris, focus and zoom control, with auto exposure and SteadyShot stabilization. An extremely shallow, 18mm flange-back distance enables the use of a range of 35mm lenses. Features include 2 XQD card slots that support simultaneous recording and relay recording. To support the FS7’s Slow and Quick motion and internal 4K recording, a new 128 GB XQD G series with ultra-high speed transfer up to 440MB/s (read) and 350MB/s (write) has been developed. The low-pass video filter, progressive pixel reading and advanced camera processing give users a broad span of creative treatments and options such as high speed recording, high resolution and high sensitivity, with less aliasing and less rolling shutter. 4 built-in ND filters allow full exposure control in a range of lighting conditions, without requiring external ND filter equipment. S-Gamut3/SLog3 & S-Gamut3.Cine/SLog3 are supported for flexibility of post-production options. The camera’s 11.6 million-pixel Super35 Exmor CMOS sensor delivers enhanced sensitivity, shallow depth of field, a high signal-to-noise ratio for fantastic low light performance. Sony’s Super 35 Exmor CMOS Sensor.